Free range, great tasting meat; Hidden Valley Chicken. Our chickens, whatever their breed, are never forced on. Even the hubbard birds that are used in commercial free range systems, reaching slaughter weight in 60 days take at least twice as long with us. 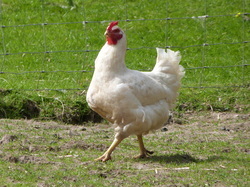 The chickens are wild and nomadic, only shut away for their own safety at night. It all makes for a completely different depth of flavour and texture to the bird; a little certainly goes a long way. 'Debbie and Simon's Christmas hamper was delicious and extremely well presented. The food was excellent and will order again this Christmas'. Free range, great tasting meat; Hidden Valley Poultry. Seasonal Christmas turkeys are available. Most of our Turkeys and Geese are reared to order so please order early! We will also bone your turkey and stuff it with other boned poultry (chicken/pheasant/duck etc.) if you wish. Crown roasts and boned and rolled are also available for that extra special Christmas dinner. All hampers must be pre ordered. Please contact us to discuss any of the above. Mixed meat boxes are available, have a little of everything you fancy!